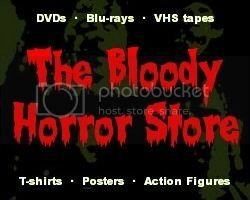 No matter how many horror films you watch on television, Netflix, or the various movie sites on the internet, there will always be some which you have to buy on DVD. Sometimes it's because there is no other choice, but, more often than not, it's because you really like the film and want to own a physical copy of it. Even if you have a limited budget, before long you will find that you have amassed considerably more DVDs than you realised and then storage will become a problem. Here are some tips. You are probably all familiar with the various Brentwood/Tree Line/Mill Creek Entertainment bargain DVD packs so I don't need to say very much about them. They come in various sizes from double-features to 100 movie packs. There was even a 250 pack of horror movies which has now been discontinued. I have one and a lot of titles weren't even horror on it so you haven't really missed out. The best of these Mill Creek packs are the "Chilling Classics 50 Movie Pack" (although you really need the older version not the new one as they have changed at least one disc on there to crappier movies) and the "Gorehouse Greats" 12 movie collection. If you buy the other "Chilling 20 Movie Pack", you get the best selection from all the other 50 packs, in my opinion, but your taste could be different. The transfers may not be the best available but being able to fit around 700 horror movies on one shelf is the kind of thing which dreams are made of for those with limited space. More mainstream double, triple and quadruple features have also started to appear and are easily found in places like Wal-mart, Target and K-mart. At the present time, "4 Film Favorites" packs of Hammer's Dracula movies, "Final Destination" 1-4, "Critters" 1-4, and all 8 "Nightmare on Elm Street" movies over two packs, are very good value at $9.99 each and, of course, they take up 5 DVD spaces on your shelf rather than 20. Everybody seems to be in on the triple and quadruple packs with MGM and Lionsgate being the biggest players when it comes to horror. There are even 4 and 8 movie packs from Echo Bridge which have brought back some quite hard to find cult '80s horror although you do have to be careful as the titles tend to get duplicated across several sets. As horrible as it may sound, there really is no point in having more than one copy of any film. Sometimes the only difference is the artwork on the sleeve or one more 5 minute special feature which you know you will never watch anyway. I hardly watch any special features on my own DVDs although I have been known to listen to the director's commentaries when I've been too lazy to swap the DVD in my player for another one. The "special features" thing has always been a bone of contention for a lot of collectors who would have preferred a better transfer of the movie itself instead of all the superfluous padding. Some people enjoy them though so it's all down to personal choice about which version of the DVD you choose to keep. Based on my own experience, I tend to buy the "Collector's Edition" sets and get rid of the previous incarnation of any title. I still don't collect Blu-ray because it's too hit or miss when it comes to horror movie transfers and, most of the time, there's absolutely no difference in the quality. I've heard stories that certain films even look worse on Blu-ray than DVD. You will NEVER own every horror film ever made although it's possible to have a damn good try. Some simply do not even exist on DVD (or even VHS for that matter). Once you've got your head around that disappointment, you can concentrate on the films which are important to you. There are some collectors who specialise in Asian horror, Italian horror and gialli, Hammer and Amicus, or any number of foreign countries with a finite number of available titles. The largest of these is undoubtedly Asian horror with just under 200 titles. Collecting them all is fairly easy and will fit quite nicely on one set of those Sauder multimedia shelves which you will learn to appreciate. Why specialise? Because of the nature of collecting, there's always a feeling of dissatisfaction when you can't complete something. With movies of any genre, there will never be a time when you can collect them all so breaking them down into achievable goals will make you a lot happier. If while browsing your local DVD store, you come across a horror title which you've never seen and never heard of anyone in it, the chances are that it will be some amateur, handycam crap which you will regret buying. Go home, check it out on the internet, and feel happy that you saved your money. However, sometimes that particular DVD may be a renamed movie from a different country, a retitled remastering of something previously available on VHS, or it might even be the most fantastic new movie which you've never seen. Whatever the case, do your homework. DVDs will never be sold out and there are very few rarities so when you return to that DVD store a week later, you might even find that the price has been reduced. If you want to build up a huge collection of mainstream titles really quickly and cheaply, the best places to visit other than thrift stores are your local pawn and swap shops. Depending on the location, you can often find unbelievable bargains especially if you buy in bulk. It hasn't been unheard of for DVDs to go for a dollar each if somebody was to buy, for instance, 250 DVDs in one go although you may reasonably expect to pay between $2.50 and $5 for each DVD in most places. Sad as it may be, some people simply get tired of their horror DVDs (or they watched a particular movie which wasn't at all to their taste) and cash them in so the pawn shops will always have a steady stream of horror titles. If you are a bit snobby about going into pawn shops, think of it as recycling. It's good for the planet and even better for your wallet. No matter how frugal you've been, you will never have enough space if you start collecting horror DVDs. There will always be one (or ten) more that won't fit on a shelf where you wanted and re-arranging will drive you mad. Sauder's multimedia storage shelves are the most used by DVD collectors and are pretty cheap but they still take up a lot of room. If you really can't display your collection, the best solution is Case Logic (or similar) folders for the DVDs themselves and a separate folder (or box file) for the artwork. Storing the empty cases in boxes in your closet may be your only solution eventually. Whether you use a dedicated program, a spreadsheet, a text file, or just an old exercise book and a pen, it's a good idea to keep a record of your collection. Not only will it save you from buying duplicates of the same DVD but it will also highlight any holes in your collection. Think like a video store owner and make an inventory of your stock. For those people who lend their DVDs to other people, it's often the only way of keeping track. As tempting as it may be to download everything, print out your own artwork and create your own own DVDs, don't do it. Not only are you stealing but, more importantly, your collection will look like crap. Downloading and burning DVDs will take up valuable time which you could have spent watching horror movies, will never be the same quality as a legally purchased DVD, and, could (although it's highly unlikely) get you into a lot of trouble with the law. Of course, there are exceptions to this as there are hundreds of horror movies in the public domain which are free for anyone to do with as they wish. Even so, it will be far cheaper and less time consuming to just buy 50 movies from Mill Creek for $10 than to go through all that hassle yourself. Don't avoid sellers with negative ratings as they often have a lot of satisfied customers as well. Some people just like to whine and moan about everything so read the feedback before making up your mind. Do avoid the bidding wars. No second-hand horror DVD is worth more than $5 unless it's an OOP, gold-plated, autographed, Director's Cut with seventeen discs of special features. There will come a point when you start to wonder if you are collecting or hoarding. Obsessive collecting is a mental illness, for sure, so always remember why you are buying movies on DVD. They aren't trading cards or stamps which you need to hide away from prying eyes but a source of entertainment which you should enjoy. Pull a stack of them out regularly and enjoy horror movie marathons either on your own or with friends. If you drop a disc or scratch one, it's not the end of the world. If you've ever seen the state of Netflix DVDs then you know it will still play and, should it be too far gone, you can always buy another one. There's a huge myth about "rarities" but no DVD is ever that rare. If it was made once, you can be sure that it will be released again even if it goes out of print for a while. Usually an OOP title will reappear with a remastered/restored/special edition just to annoy you.